Different suspension files have varying capacities. The most popular standard files (with a V-bottom) have a capacity of 15 mm of documents per file. If you have overloaded or over-crowded files you should consider the larger capacity square bottom files with either a 30 mm or 50 mm gusset. Foolscap size available in packs of 10, 20 or 40 Files. 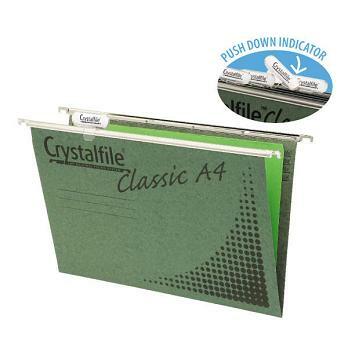 Pack of 20 A4 size files complete with tabs & inserts. 30 mm square base holds more than standard suspension files, holds up to 300 sheets of paper. 50 mm square base holds more than standard suspension files, allowing you to file everything in the one file.